Paolo Di Canio has resigned as manager of League One side Swindon. The 44-year-old Italian was set to quit last week because of off-field events, including the sale of Matt Ritchie. But the ex-West Ham star said he would have stayed had the Football League agreed to the purchase of the club by new owners by 17:00 GMT on Monday. "Paolo Di Canio's resignation isn't really too much of a surprise. "But the understanding is that a takeover will go through on Tuesday, and so many will question the timing of Di Canio's resignation. "They will want to know why he couldn't have waited 24 hours. The timing of this statement is strange to say the least." "I've been told approval has not been granted yet and therefore my temporary arrangement has ended and my resignation stands," he said. It was announced on 30 January that a local consortium, fronted by Banbury United owner Jed McCrory, had agreed a takeover, subject to Football League approval. Di Canio's assistant Fabrizio Piccareta will take temporary charge of the club for with the club voicing their surprise at the timing of Di Canio's exit and confirming that they expect the takeover to be completed soon. A club statement said: "The board are disappointed that Paolo Di Canio has made the decision to resign at such a critical time. "We are also disappointed that the sale of the club has yet to be approved, but we hope the outstanding issues with the Football League will be resolved within a short period of time. "A win at Tranmere would see Swindon become leaders of League One. The board shares the fans' tremendous frustration at the events of the last few weeks and is determined to resolve these issues to ensure the best outcome for the club." 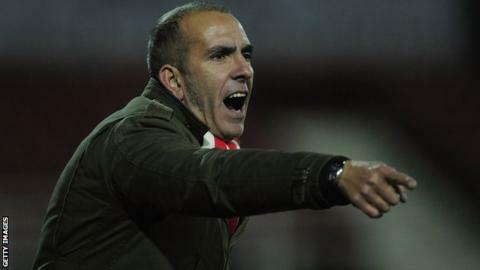 Former Swindon chairman Jeremy Wray - who appointed Di Canio - told BBC Sport that business decisions made by his employers in recent weeks might have led to Di Canio's decision to leave. "You can be disappointed when goals change, but if it is communicated in the right way and you have a chance to listen to a new plan then you get a chance to reflect on it," he said. "If it is not discussed at all, then I think it is very hard. I think that is where he has found himself. "The sale of Ritchie may well needed to have happened, but it needs to have been communicated with him and explained why and discussed what the best way forward is after that. "As I understand it, Ritchie was sold without anyone communicating it to Paolo. To hear it first from the player is unforgivable." In their statement, Swindon said that Ritchie was sold "due to the tremendous financial pressure the club is facing and in order to continue operating whilst the sale of the club went through." Di Canio, who played for Juventus, AC Milan, Lazio, West Ham and Celtic among others, took over at Swindon in May 2011, following their relegation to League Two. In his first managerial role, he led the Robins to promotion as champions last season, guiding them to the final of the Johnstone's Paint Trophy. They are currently sixth in League One. However, there was uncertainty over the club's future following the news that owner Andrew Black had put the club up for sale because he was no longer willing to invest. The club were considering entering administration in order to wipe out £9m of unsecured debt. It was then revealed that a local consortium, fronted by Banbury United owner Jed McCrory, had agreed a takeover, subject to approval. The announcement could not prevent star winger Ritchie signing for Bournemouth for £500,000. "As I had previously stated, there have been a number of broken promises made by the club over the time that I have been manager of Swindon," added Di Canio. "Despite these problems, I have delivered everything and more that was asked of me - achieving promotion last year as champions and competing this season for promotion to the Championship, and being just three points from top place a year earlier than expected. "I did not resign immediately, nor publicise my resignation after I had formally confirmed it, as I did not want to jeopardise the negotiations for the sale of the club and I wanted to listen to what the proposed new owners plans were."